Van Halen has long been one of my favorite bands, but they have been a certifiable apocalypse for the last 15 years. They've botched reunions, best of compilations, a Rock 'N' Roll Hall of Fame induction, and even an installment of Guitar Hero—with a whole lot of nothin' in between. 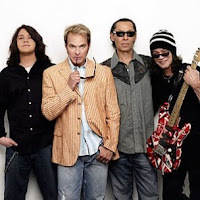 But now, the band is reportedly prepping a new album for release early next year—their first since 1998, and first with David Lee Roth since 1984. I'm doing my best to keep expectations in check after a decade and a half of disappointment, but this album had better solve world hunger. Recently, Kristen was with the kids at Port of Subs without me, so of course Eddie needed to go potty. It was already a struggle helping him up onto the toilet seat while still holding Violet, but then there was the little detail of the bathroom floor being freshly mopped. I don't laugh out loud very often, but I sure did when I received the text from Kristen informing me that she may have pulled her groin. After somehow recovering from doing the involuntary splits without dropping Violet, she was reminded of a handy item from Dave Barry's 2008 gift guide: the restroom baby hanger. Eddie loves his share of boy stuff—Star Wars, superheroes, cars, etc. But spending most days home with Kristen means he has seen Pride & Prejudice more than a few times. By now, he has really gained a decent understanding of marriage and society in 19th-century England. His favorite character is "Mr. Jingley," but we couldn't find any good merchandise that features him. Instead, I think he'll happily settle for this Mr. Darcy muscle shirt. Alternate: A Magic 8-Ball that answers "why" questions. I would say all Violet wants for Christmas is her two front teeth, but she's not picky. Any teeth will do at this point. 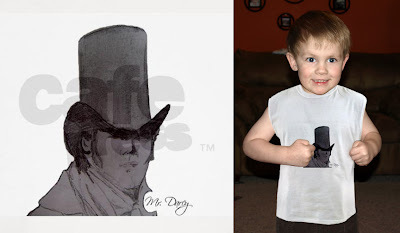 Seriously... nobody is going to comment about the fabulous Mr. Darcy muscle shirt? Our readers are becoming slackers, methinks. And yes, the baby hanger is a real thing. I have been tempted many times to buy such a contraption. More businesses should install those little baby seats that fold out of the wall in the family restroom.